It’s hard to know just where to begin with the Café Royal. 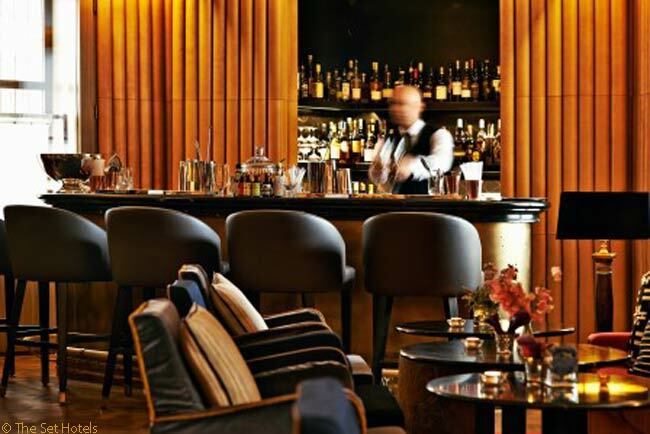 Since opening its doors in 1865, it has been a fixture of upmarket London social life, first as a long-lived, celebrity-haunted restaurant and bar, then as a nightclub and now as a stylish 5-star hotel that smartly enfolds the old café space. My wife, Georgina, and I stayed at Hotel Café Royal for two nights in October 2015. 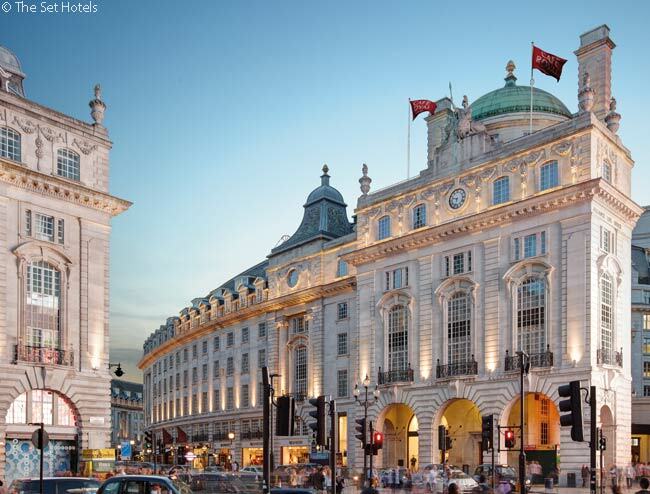 The three-year-old, 160-room luxury hotel, located on Regent Street just off Piccadilly Circus, offers the sybaritic Akasha spa, five good restaurants and three lively bars. It boasts in-room amenities such as Carrera marble bathrooms and Bang and Olufsen flat-screen TVs. Wi-Fi is complimentary throughout the property. Triple-glazed windows hushed the cacophony of Regent Street under the window of our third-floor junior suite. If I had a pound sterling for every hotel I’ve stayed in with purely notional sound-proofing I could retire right now in comfort. But in Hotel Café Royal: bliss. The near-silence is just the thing for jet-lagged travelers just off long-haul international flights. Restoring a heritage property – and not just restoring it but expanding and transforming it from a smallish restaurant to a mid-sized boutique hotel inside the bones of three Grade II listed buildings – is a tricky business. This is, after all, where the great and the good from politics and the arts gathered for generations. George Bernard Shaw, H.G. Wells, Arthur Conan Doyle and later stars such as Elizabeth Taylor, Graham Greene, Mick Jagger and David Bowie hung out at “the Café.’’ Most famously, Café Royal was where Oscar Wilde scattered bon mots and wicked epigrams and where he dined daily. 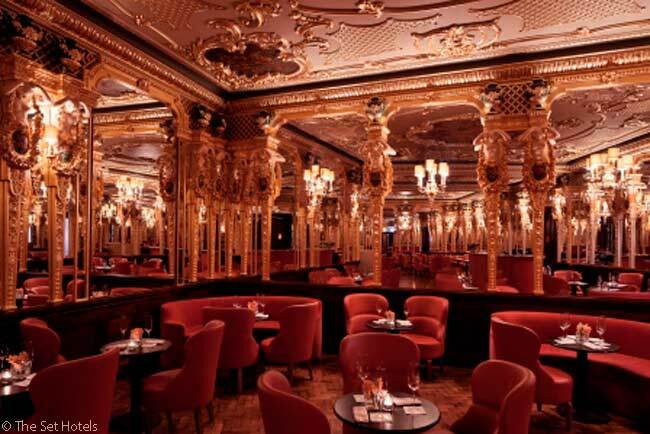 These days, the former café’s Grill Room, restored to its earlier gilded, mirrored Louis XVI-style opulence, is the Oscar Wilde Bar. 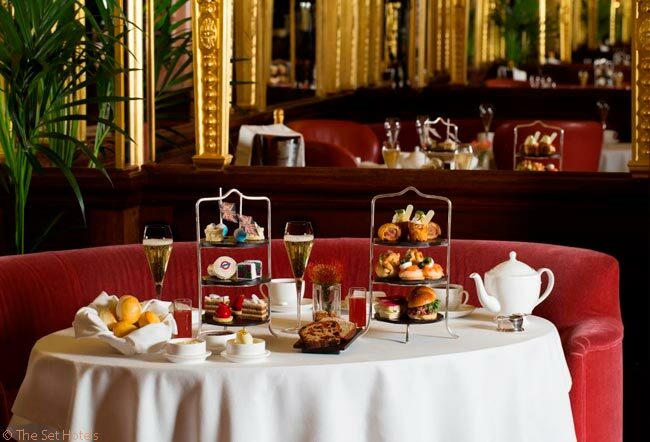 It is open for afternoon tea and occasional evening cabaret performances. Georgina and I enjoyed tea there with tasty sandwiches, scones, jam and clotted cream, flutes of Champagne – and a short, gracious talk given to guests about the room’s provenance. 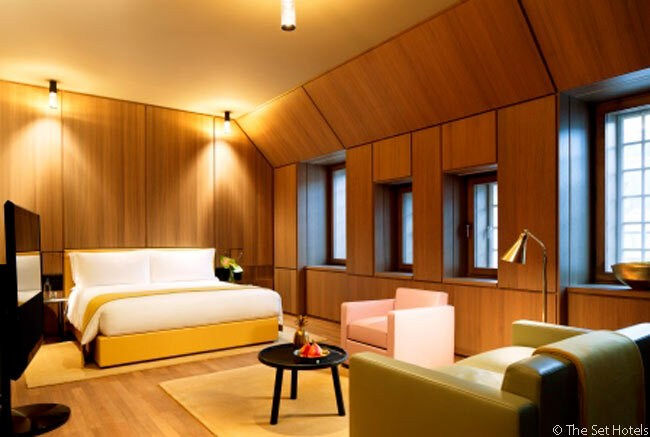 The owners, The Set Hotels, based in Tel Aviv, were careful to embed key features of the vintage buildings into the new hotel, which has a minimalist 21st-century design in guest rooms and restaurants. 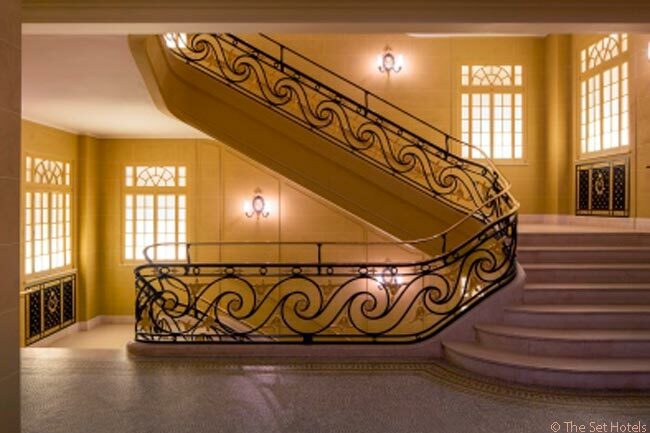 They adapted the high-ceilinged entrance to the old café as the hotel’s lobby, and spruced up the central marble staircase. They also retained the vintage lifts (elevators, to Americans). Although the lifts work fine, I often took the grand staircase, so I could see more of the hotel’s chandeliered public spaces. Taking the stairs gave me my first glimpse of the expansive sitting room and bar on the mezzanine – which, unusually for London hotels, is used by a private members’ club. Hotel guests who have booked a suite gain access to some areas of the Club at Café Royal. We sipped coffee, gazed at book-lined shelves, eyed a photography exhibition and peered over the mezzanine railing at the Ten Room, the all-day casual dining restaurant just below. We took breakfast in the Ten Room, feasting on some of the best full English breakfasts – those sausages, those juicy grilled tomatoes – I’ve had anywhere. One tradition that has not endured is the now-vanished, curving marquee outside the hotel’s main entrance. Georgina, a native Londoner, liked the landmark marquee, and misses it. I asked a characteristically helpful and decidedly unstuffy staff member why the marquee didn’t survive the renovation and was told it just didn’t go with architect David Chipperfield’s sleek new design. One can’t have everything. But the new owners tried. They shuttered the buildings in 2008 for four years to reconfigure the interiors and spent millions on the project. It opened in December 2012. There’s no arguing with the Regent Street address. The graceful swan’s neck of Regent Street is one of the prettiest sights in London, thanks to Victorian architect John Nash, who designed the curving, colonnaded street in 1865. Many exteriors of Regent Street buildings are attractively clad in Portland stone, giving the street a look both unified and dignified. The hotel references that look in its 48 suites with attractive plaster castings on the bedroom walls. In the spacious bathroom off our bedroom was a contemporary, marbled rainfall shower room big enough to accommodate a board meeting. A work desk with UK, US and European power sockets, a reading chair and a low-slung couch shared the spacious junior suite. Many of the British capital’s popular attractions are walking distance or a short Tube ride away. We walked to the Royal Academy of Arts, the wonderful, 218-year-old Hatchard’s bookshop, heaving Leicester Square, West End theaters, Green Park and much more. Rakish Soho is just east, stately Mayfair just west. At night we had the not-unpleasant sensation of hearing the soft rumble of Underground trains in Piccadilly Circus Station from our comfortable bed with its plush Frette linens. 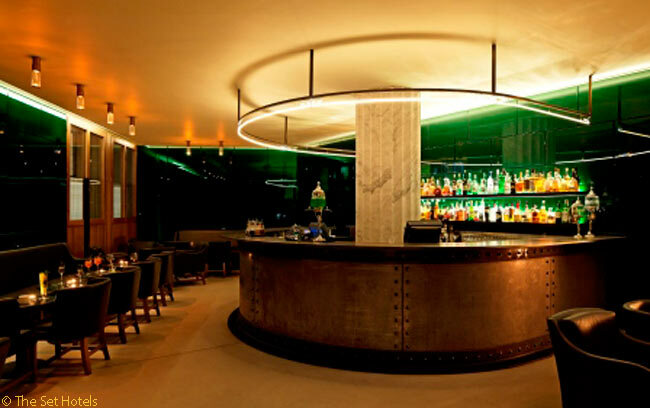 When not enjoying a shockingly green absinthe cocktail in the hotel’s aptly named Green Bar – another nod to the bohemians of yesteryear – business travelers and celebrants can make use of two well-appointed banqueting suites and four meeting, conference and social function rooms. And, finally, when deal-making pressure makes itself felt, the Akasha Holistic Wellbeing Centre awaits with a diverse menu of stress-busting treatments and hedonistic pampering. I chose a 50-minute massage, requesting just a whiff of aromatherapy and a gentle kneading of knotted muscles. I got both. I am not a major spa fancier, but even a whinger like me could think of nothing to complain about. And I still can’t. This is just a very good hotel. 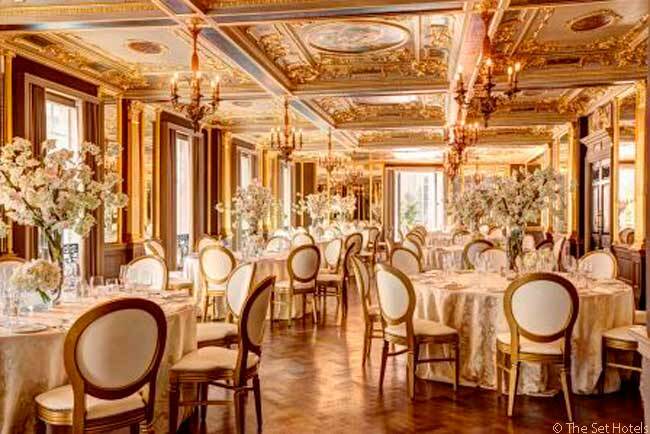 Hotel Cafe Royal is located at 68 Regent Street, London W18 4DY, England. Rooms start at £323 (US$488) a night. 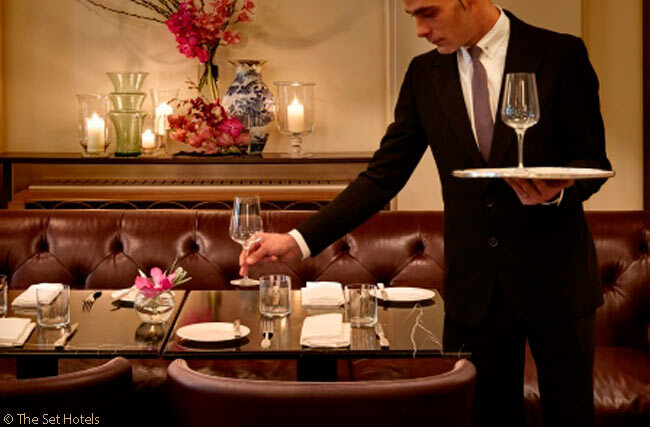 For reservations, phone +44 (0)20 7406 3333, e-mail reservations@hotelcaferoyal.com, or visit www.hotelcaferoyal.com.